Alachua County Commissioners on Tuesday heard at least one conclusion they already knew: Interstate 75’s passage through the county is a double-edged sword. “Having I-75 go through our county is both a benefit and a burden,” Sadie Darnell, Sheriff of Alachua County said. 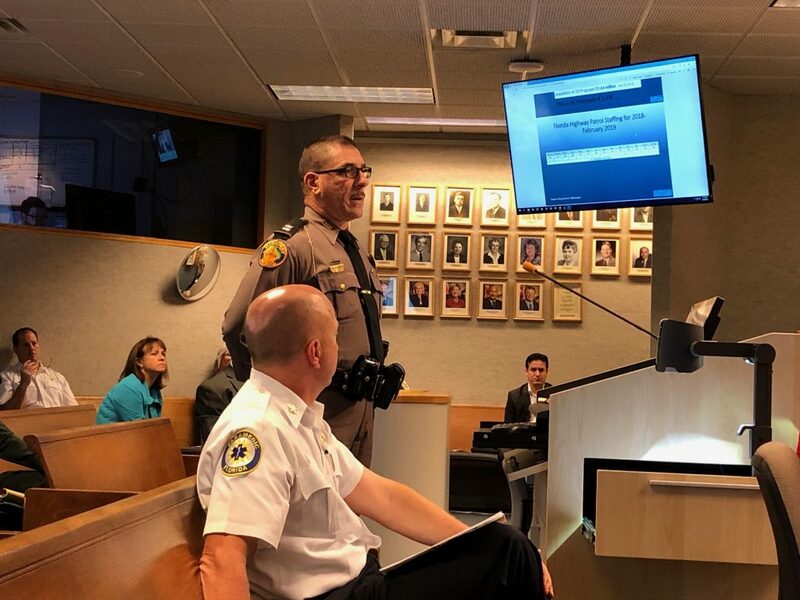 Representatives of the Florida Highway Patrol, Alachua County Sheriff Office and Alachua County Fire Rescue were invited to share to commissioners a joint presentation about I-75 public safety issues. They hope to work collectively in finding a resolution to the dozens of crashes that have taken place on it in the past five years. 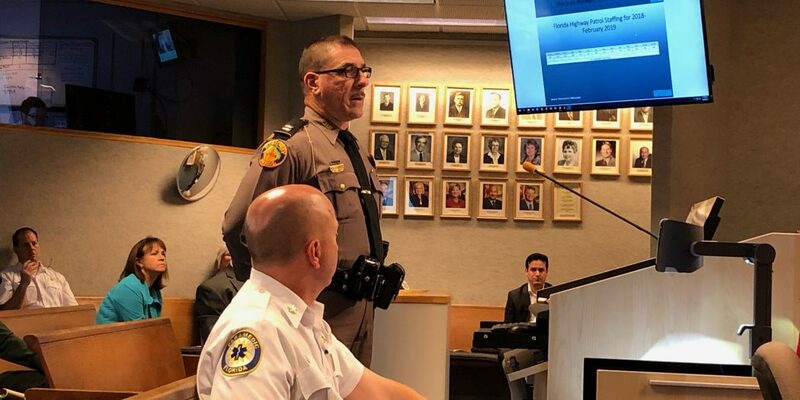 Each commissioner received a printed copy of the seventeen-page presentation that incorporated data and visuals that outlined recent incidents on I-75. This major roadway into Florida has been the topic of discussion for years. Most recently an I-75 crash on Monday caused the shut down of all northbound lanes in the Micanopy area. Two vehicles were heavily damaged and one overturned. 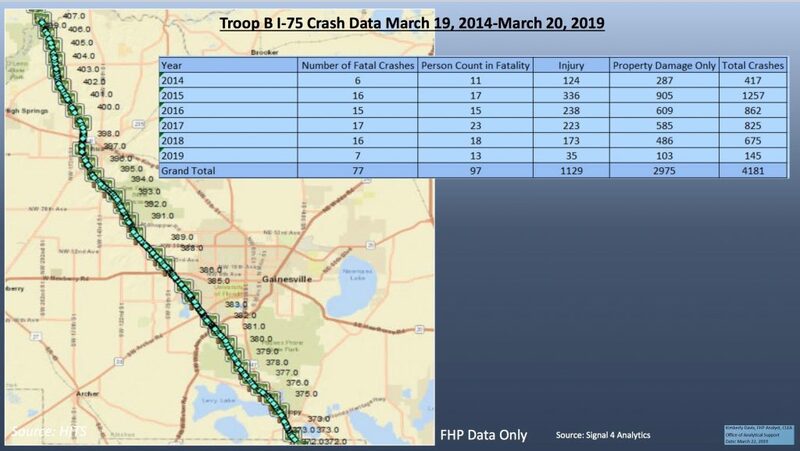 From March 2014 to March 2019 there were a total of 4,181 crashes on I-75 in Florida, according to Florida Highway Patrol crash data. This includes injuries and fatalities. “We are making some headway,” Capt. William Tierney of the Florida Highway Patrol said. He was the first to present, displaying data from a five-year period. Although the number of total crashes has decreased from 1,257 to 675 from 2015 to 2018, the fatality rate remains high. “On a good day, we can have three troopers and one sergeant working the entire county,” Tierney said. The troopers make it work, but their biggest challenge is having to cover I-75 and state and county roads. 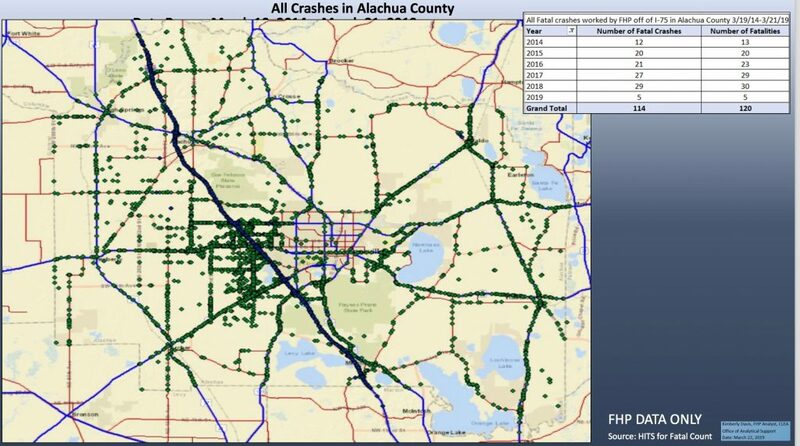 A map displaying all crashes in Alachua County using dots showed fatality rates were slightly higher off the interstate than on it. Troopers, though, have to juggle all calls for service. Tierney mentioned times when “sister districts” were called to assist with crashes and provide enforcement if available, in addition to help from the Alachua County Sheriff’s Office. The maps and data presented gave commissioners an idea of what the county is up against when responding to crashes. The horrific I-75 crash that killed seven people in January is a poignant example. Semi-trucks, in other words, are major contributors to traffic issues. Tierney said one out of four vehicles traveling on I-75 through Alachua County is a commercial motor vehicle, which causes more damage and longer road closures when involved in crashes. 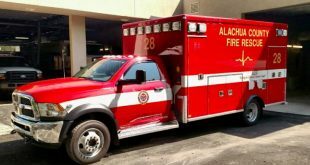 “It is the most unpredictable environment for fire rescue,” said Fire Chief Harold Theus of the Alachua County Fire Rescue regarding interstate calls. He used pictures of various incidents on I-75 throughout 2018 to help paint a picture of how great a threat this roadway is to public safety. Theus reported 422 interstate incidents in 2018 alone. The issue of staffing proved to be a common theme among the three presenters. “Are the numbers down because of the requirements of the job or because of lack of funding from the state?” Commissioner Marihelen Wheeler asked. Tierney noted a 50 percent shortage in staff due to troopers retiring, transferring or quitting. As a result, there are only two troopers and a sergeant on the roads daily. The inconsistency with staffing makes it harder to maintain enforcement and work crashes. The Alachua County Sheriff’s Office is pushing to reinstate an I-75 traffic unit, while also adding the interstate to the 11 zones it covers. Five deputies would be needed to staff the zone and would be working 24/7 every day of the year. The Alachua County Board of County Commissioners drafted letters in support of Sheriff Sadie Darnell’s concerns regarding Interstate 75 and U.S. Highway 441 traffic and safety. Plans to send the letters to the Department of Transportation and state Sen. Keith Perry are still being discussed. Commissioner Mike Byerly proposed a motion to refer the issue of safety enhancements in Alachua County to the first available agenda item of the Metropolitan Transportation Planning Organization for the Gainesville area. Extending an invitation for the Department of Transportation to present its approach to interstate safety enhancements to the county commission was also included. “We want the [Department of Transportation] spending more money in our county saving people’s lives and keeping people safe,” Byerly said. Charles Chestnut, the commission’s chairman, also motioned for drafting a letter in support of increasing law enforcement staff. Juzanne is a reporter for WUFT News who can be reached by emailing news@wuft.org or calling 352-392-6397.